The CEO Photo Exhibition, featuring 98 photographs by 37 CEOs, including Chang Jae-ku, chairman of the Hankook Ilbo and The Korea Times Group, held an opening ceremony Tuesday at the Ewha Art Gallery, Ewha 100th Memorial Hall, Seoul. The exhibit, which will run through May 10, displays the works of chief executive officers of the nation's top companies, showing off their talents to catch a glimpse of the world. 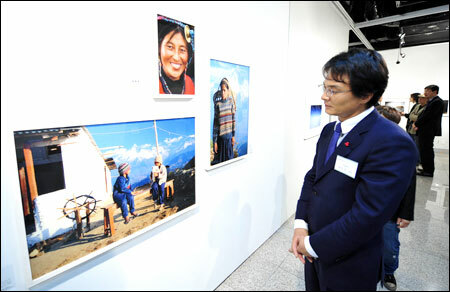 Not only Chang, but also celebrated photographer Kim Jung-man, actor Cho Min-ki and other CEOs are taking part in the exhibit. Chang presents three works, including ``Gurung Girl and Mt. Machapuchare, Pokhara, Nepal'' which was carried in ``Jaeku Chang 75 Photographs,'' a collection of photographs published last year. Cho held his first exhibition in 2005, which displayed a collection of photographs taken during his journeys and also donated the proceeds from his third photograph exhibit to those suffering dire poverty. Other works are from Kim Hyo-joon, BMW Korea CEO; Julia H. Moon, Universal Ballet general director; Choi Joon-keun, HP Korea CEO; and Lee Haeng-hee, Corning Korea president. The exhibition is designed to share the CEOs' talents with society. Proceeds from the exhibition will be donated to multi-cultural families in Korea.